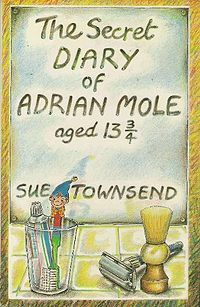 You’ve probably heard the news that Sue Townsend died yesterday, author of the bestselling Adrian Mole books that defined teenage angst in the ‘80s and beyond. Social media was abuzz last night, with then unconfirmed reports and tributes to her comedic skill and impact on a generation. Many tweeted that she was our JK Rowling and Adrian Mole was our Harry Potter. I studied creative writing with her on a Greek island in 2001. Even then, she was unwell and missed the first week because of a problem with her foot. She’d suffered from diabetes for years, and had recently been declared blind. Running classes outside a taverna, she would make notes on an A4 pad using a thick black marker, fitting only a handful of words on each page and peering at them through dark glasses. I had to press her for the story of how she started to write. Her first husband didn’t support her literary efforts, so for years she hid her writing under the sofa cushions. She entered and won a local playwriting competition not knowing the prize was to have her play performed – her secret was out, and she divorced that husband and married another. She was self-deprecating, insisted her work always needed a lot of editing, and inspired us to write plays, poems and stories about whatever we were passionate about. Her passions were clear in her own writing: Leicester, people, socialism, and latterly, health issues. In that creative environment, I wrote some of my best work. One morning, a poem about the whole experience fell off the end of my pen – not even in my own handwriting. I also wrote an Adrian Mole story as a gift for Sue, but lost the courage to give it to her. When I knew her, she smoked, drank, enjoyed the sun and made us laugh. After a kidney transplant in 2009 and a stroke in 2012, her suffering is now over and Heaven is a funnier place. I loved her style of writing, and enjoyed the Adrian Mole books, but also her later ones. How lovely to have actually met her and worked with her! Do you still have the poem she inspired you to write? Can we see it? Thanks for asking to see the poem. I would love to share it with you but it’s in the loft and I don’t have a digital copy. Next time I go up there, I’ll find it and blog it.